For people in parts of Central, East Gippsland, North Central, North East and West and South Gippsland Forecast Districts. Issued at 5:53 am Friday, 5 April 2019. Weather Situation: Northerly winds forecast to strengthen across southern Victoria late on Friday ahead of a cold front. 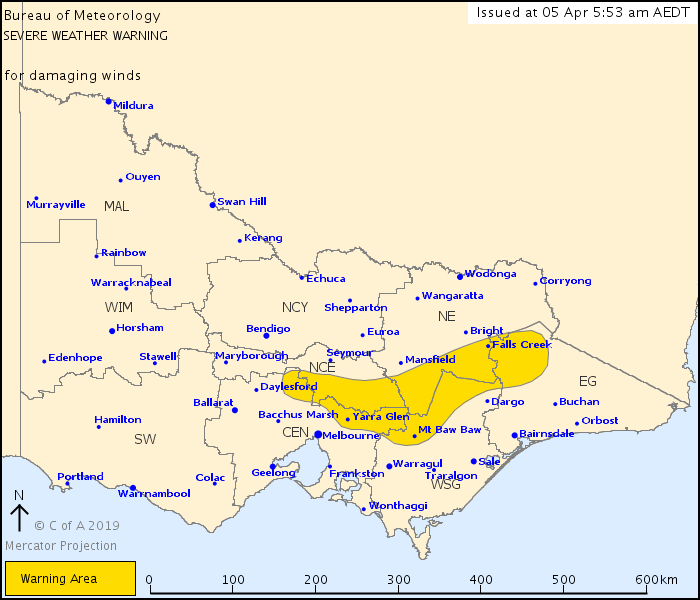 DAMAGING WINDS, averaging 50-70 km/h with peak gusts of 90-100 km/h are possible over parts of the Central and North Central districts Friday night, extending to West and South Gippsland, East Gippsland and the North East districts early Saturday. Damaging winds are expected to be restricted to above 500m elevation. Northerly winds are expected to shift west to southwesterly and rapidly ease on Saturday morning as a cold front crosses the State. Locations which may be affected include Yarra Glen, Mt Baw Baw, Falls Creek, Mt Hotham, Mt Buller and Omeo.